Advocate Prashant Bhushan, for the petitioner-organisation, voiced the prayer for the quashing of M. Nageshwar Rao's appointment as the interim CBI Director, advancing that the government had no such power and that the appointment was to be at the instance of the Selection Committee. "It is not an appointment. An appointment has to be by the Committee 100%. But in the event of a vacancy if, say, someone goes on leave, then how does it have to be filled up? ", asked Justice Arun Mishra. Addressing Attorney General K. K. Venugopal, the judge inquired why the Director has not been appointed so far- "the interim Director cannot continue for so long. The CBI Director is such a sensitive post. You already knew that he (erstwhile Director Alok Kumar Verma) was retiring on January 31"
Pointing out the matter was in court on which judgment was rendered by Chief Justice Ranjan Gogoi, the AG submitted that the High-Powered Committee has already met once, of which meeting the minutes are available. Initially, he said that the next meeting was expected to take place in a week's time, but then he corrected himself, informing the bench that the meeting is scheduled for later on Friday itself. "It is an important post. It cannot function on an ad-hoc basis. For 7, 10 or even 15 days we can understand. But not any longer", observed Justice Mishra. "There was a situation which has never transpired before. The two senior-most officials were fighting in public domain. There was a need for an immediate action...", explained the AG. "The CBI was not functioning properly. Not just fighting, they leveled corruption allegations against each other. That was wholly unbecoming of the officers...but we are averse to this arrangement. When are you going to do it? Tell us? Let us post this for Monday. And we should not pass any order as the person-in-charge is only an incharge...", noted Justice Mishra. "At the last meeting, a decision could not be taken as the Leader of the Opposition (Mallikarjun Kharge) Needed more details...", said Mr. Venugopal. "40 officers were transferred in the last week (by the acting Chief)...", interjected Mr. Bhushan. "The new director who comes must look into what even the earlier Director (Verma, on reinstatement by the apex court), who came for one day or two days, did during that time...not just the in-charge person...if anything wrong was done, the new Director must look into it..."
Next, the AG presented in a sealed cover the minutes of the last meeting of the Committee, which he called a "confidential document"- "What they have done is clear", said the AG. "We are only worried about one thing that you should appoint the Director. If one member wanted to verify (the details of eligible candidates), it is not bad...but no more of this in-charge business", remarked Justice Mishra. "Ultimately, it (the interim Chief) is not an appointment. Yes, the order in that behalf was set aside. But it was approved by the Cabinet Committee on Appointments. He was asked to not continue because of the reinstatement...", continued the judge. Referring to the January 8 judgment authored by Chief Justice Gogoi, Mr. Bhushan contended that the general power which the government was claiming to appoint the interim Director was held to be not valid and the permission of the Selection Committee ought to have been taken. Admitting that he was not aware of the fact, Mr. Bhushan conceded that if such a decision was taken, the issue no longer endures. He instead drew the bench's attention to the other relief sought- for the decisions at the various stages of the procedure of shortlisting and selection of the CBI Director to be suitably publicised in the interest of transparency. "We will ensure the appointment of the regular director. As for transparency, if there is any lacunae, you will have the option of future litigation. Vineet Narain (1997) has been followed and the (DSPE) Act was amended. You are right to the extent that the Ad Hoc Director should not continue. But We are not finding the scope for all this...that You have applied for the details of the procedure under RTI and they were not furnished...We give you the liberty to question the new appointment in a fresh petition, Not here because this is directed against a specific person. There is catch in this...Chief Justice Gogoi has discussed it earlier how much transparent the process has been made. He has devoted 10 pages to it...We don't want to delay the appointment...", reflected the bench. "Of course not! I am not saying that transparency should come in the middle of the appointment, but for the future. I am not even saying that it should happen for this appointment...", clarified Mr. Bhushan. "We cannot keep this pending for what may happen in the future", asserted the bench, describing the concerns as "premature" at this stage, asking the Advocate to mount a challenge as and when they arise. Mr. Bhushan, refusing to relent, moved on to rely on Justice A. K. Sikri's order (in a 2018 petition by RTI activist Anjali Bhardwaj) requiring the criteria and the names of shortlisted candidates for the post of Information Commissioners to be uploaded on the official website. "The Chief Justice has quoted Vineet Narain and the Summary of Recommendations and then proceeded to observe the government has done a lot towards transparency...", commented the bench. "Vineet Narain is not on transparency. It speaks of independence and the High-Powered Committee. 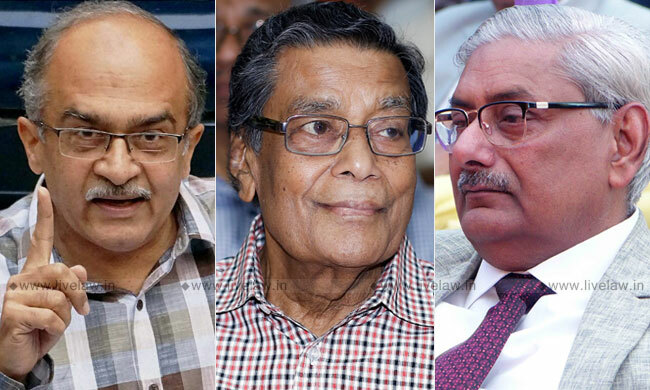 After Vineet Narain, 10 other judgments have come which insist on a transparent procedure for such important appointments...", argued Mr. Bhushan. "We need an immediate appointment. Let us stop there. If you have any grievance as to transparency, it can be challenged. We are not laying down Guidelines right now. Unless there is a concrete cause of action, we can't interfere in an administrative action", stated Justice Navin Sinha. Repeating that he is not questioning the impending appointment, Mr. Bhushan persisted, "When will that come (the concrete cause of action)? Today, they the last four batches will be considered. But on what basis will the selection be made? The shortlisted names have to be published. There have to be some Minimum norms of transparency..."
Eventually, he suggested that the matter be put up for after the appointment has been made- "Please list this on Monday. Let's see what they do"
"If They are meeting today and all the material in respect of the appointment is also furnished, the appointment will be made today. There will be sufficient publicity so that they (the petitioners) can see...the Supreme Court is expecting them to appoint today itself...", assured the AG. The petitions will now be heard next week on February 6.